Also, Chivalry and Misogyny are not the same thing. In fact, to treat a woman with respect is the exact opposite of Misogyny. 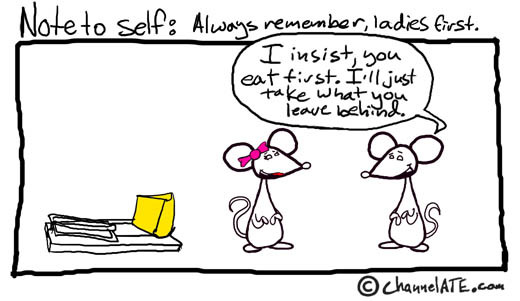 Did it ever occur to you that perhaps the joke is not that the male rat is trying to kill the female rat and take the cheese but may-haps the male rat is oblivious to the trap and it is more following the theme of “sometimes even the best intentions go awry”? Moonbloo, how do you get anything done with all that sand in your vag? Moonbloo should really keep their comments to themselves. Because now they are disliked. awwww so sweet! he wishes her to die first! Jesus CHRIST, everyone stop complaining! I come to the comments bar hoping to see some whitty comments but I see everyone GRIPING and COMPLAINING over one comment! Calm down, people, it’s OK for a lady to get ngry over womens rights, it’s not okay for people to just keep going on and on and OOOON. Jeez, take a lesson, men. Sheesh! Hmm, the link didn’t add. Lets try again. If it doesn’t work then I give up. wouldn’t it be awesome if the Ryan was Moonbloo.